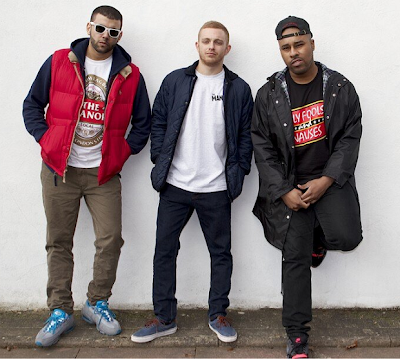 South London's very own The Manor has released the first of their many new releases for 2013. Danny Graft, Jonny Dutch and Scotty Stacks all get together for their brand new video to 'Alors En Graft' directed by the groups close friend and long-time video collaborator Postelliot. Postelliot does an amazing job capturing the fun and life in this long-awaited video, that The Manor has to offer. Making it their third sold-out live night at The Beckenham bar in Kent alone, Postelliot decided to show the rest of the world what they were missing out on - as he films them during their December show last year. With their mixtape 'Free Mixtapes Don't Pay The Rent' (which is so true - lol) still being played allover after being released in September (which has over 9,000 downloads to date) - the three lads add their own spin on Stromae's international hit 'Alors on Dance' with their own version 'Alors En Graft'. The Manor are currently nominated for 'Best Hip-Hop Mixtape of 2012' at the Official Mixtape Awards with their debut releases 'Welcome to The Manor' enjoy the Postelliot visuals in their new video below! I surely did!